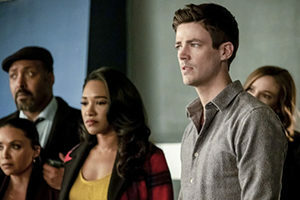 The Flash delivered a strong albeit frustrating episode this week with “Time Bomb,” which juxtaposed Nora’s (Jessica Parker Kennedy) refusal to tell Barry (Grant Gustin) about her partnership with Thawne (Tom Cavanagh) out of a misguided sense of protection against Grace’s vendetta against a metahuman keeping secrets from her family for similar reasons. 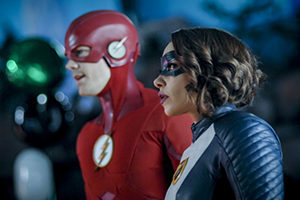 All the while, Sherloque was closing in on the truth much to Iris’ (Candice Patton) chagrin and Ralph (Hartley Sawyer) was trying to play metahuman matchmaker much to Cisco’s (Carlos Valdes) horror. RIP Westallen. They’re not dead, they just have no scenes. First, to no one’s surprise, adult Grace from the future made for a much better villain than her uncle Orlin (Chris Klein), whose swift turn into sanity now that the dark matter was removed from his body ended up being a very welcome change. The vendetta of her parents’ death combined with all the rage she absorbed from Orlin – not to mention the literal chip on her shoulder – made for a potent combination that explained her terrible actions without excusing them. She spent “Time Bomb” chasing down Vickie, the woman she believed murdered her parents in the course of a robbery, and not even the discovery that the event has been an accident could dissuade her from attempting to mete out her twisted justice. Of course, Joe (Jesse L. Martin) and Cecile’s (Danielle Nicolet) efforts to track her down easily gave way to Nora’s emotional turmoil over whether to come clean to her parents. Vickie lied to her husband and daughter about her powers for years in an effort to keep them safe and herself from being rejected, pointedly paralleling the situation Nora found herself in. Thawne warned her that the only recourse left was to tell her dad after his own elaborate and impossible to understand plan failed thanks to Grace, but the newbie speedster still took until the show’s closing moments to gather up her courage. To make the reveal even more unsatisfying, she had her thunder stolen by Sherloque’s need to narrate his discoveries concerning her notebook. This was disappointing on several fronts, because not only is having a ‘Wells’ on both sides of the Nora equation redundant, it also robs Iris of a storyline that would perfectly fit her character. Why have someone so wholly unconnected to Nora and the speedforce decode her journal for weeks while Iris tried to prevent them from invading her daughter’s privacy when Iris could easily have taken matters into her own hands as a concerned mother whose daughter was acting more than shifty? Nora has never been this grounded. But at least Iris did get something to do which tied into the Cisco story of “Time Bomb.” Things were going great with his new love Kamilla, except that he didn’t seem too keen to introduce her to his friends. That was something Ralph simply could not abide, and so not only did he intercept their date, he also got her an interview with Iris to become Central City Citizen’s photographer. It was a development fans have been waiting for since Kamilla announced her passion for pictures, and we thank Ralph for getting it done… Aside from the fact that his grand plan was to get Kamilla bitten by a radioactive arachnid so that she could become the team’s resident Spider-Woman, that is. The only one not thanking Ralph was Cisco, who finally explained under duress that he wanted his love life separate from his work life because being with Kamilla was his safe space. It’s sounding more and more like Cisco’s ready to throw in the towel, but hopefully he experiences a last-minute resurgence of love for heroism because I’m not ready to say goodbye to Valdes. By the end of “Time Bomb,” Barry and Cicada both found themselves shocked and betrayed by their daughters in a series of events that turned out much differently than Vickie’s confession to her family. While Grace literally killed Orlin rather than face his disappointment in her actions, Barry put Nora in the most extreme form of time out upon learning about her betrayal: the pipeline that he reserves for criminals. The former came after one of the better Cicada battles this season, and the latter was one of the more powerful reveals The Flash has pulled off in recent memory. Gustin nailed the betrayal Barry must feel at the thought of Nora working with his mother’s killer, and Patton brought the heartbreak as well despite not getting lines in which to acknowledge it. Now we’ll see if next episode follows through on the angst of those last few minutes, although we’ll have to wait nearly a month to find out. The Flash returns April 16th at 8/7c on the CW.